High Roller Hammond. Image via Blizzard Entertainment. This hamster is ready to hit the town. Wrecking Ball is the lucky recipient of the newest skin reveal for the Overwatch Storm Rising event, which runs from April 16 to May 6. The “High Roller” Wrecking Ball skin was revealed exclusively by PlayStation today. High Roller, which will be an epic skin, upgrades the hamster’s usual blue killing machine to a sleek black, grey, and red vehicle with gleaming gold details. Hammond himself gets a brand-new outfit complete with a gold headpiece and some seriously cool sunglasses. How else can he handle the sparkle of this skin? 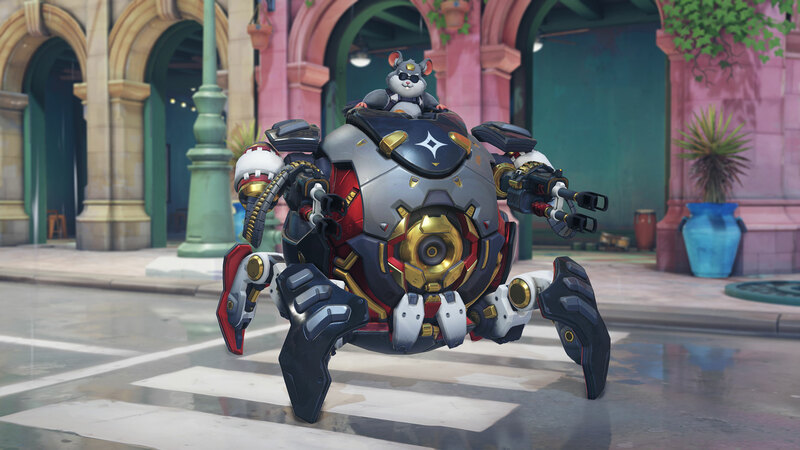 Wrecking Ball is the code name for Hammond, who was one of the animals given genetic alteration therapy on the Horizon Lunar Colony along with fellow tank Winston. After the colony fell, Hammond made his way to Junkertown and used his superior intelligence to create the Wrecking Ball machine. This is the second event skin for Wrecking Ball, who got turned into a jack-o’-lantern for Halloween. The Overwatch Storm Rising event will run from April 16 to May 6 and will revolve around a mission in which Tracer, Genji, Mercy, and Winston have to track down the mastermind behind Talon, Maximilien. Skin reveals have been coming at a quick pace—Wrecking Ball is the second hero to receive a skin today, after Deadlock McCree was revealed. According to the Overwatch Archives site, four skins remain to be unveiled.